The UN Migration Agency (IOM) has identified 256,615 internally displaced persons (IDPs), 227,866 returnees and 351,382 migrants in Libya. These new findings are a result of IOM’s latest Displacement Tracking Matrix (DTM) in Libya. The full reports can be found here: Migrant and IDP information packages. 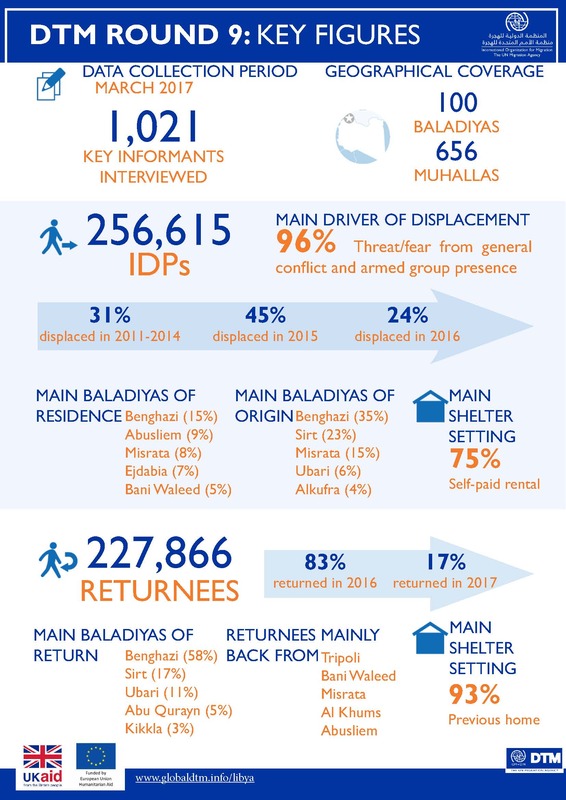 The information packages present data gathered on IDPs, returnees and migrants in March 2017 through interviews with 1,021 key informants. The informants include representatives of baladiya (municipality) offices, local crisis committees, and others in the community with knowledge about IDPs, returnees and migrants in their communities. The report shows that IDPs were mainly displaced from Benghazi, Sirt, Misrata, Ubari and Alkufra. Twenty-four per cent were displaced in 2016, 45 per cent in 2015 and the remaining 31 percent between 2011 and 2014. Eighty-seven per cent of IDPs were accommodated in private shelter settings and the remaining 13 per cent were residing in informal settings, public buildings, schools, unfinished buildings or other forms of public shelter. In addition to reporting on IDP and returnee shelter settings, the report also provided a general overview on the status of health, education, security, nutrition, livelihoods and access to market in each baladiya. The main nationalities of migrants identified were Nigerian, Egyptian, Sudanese, Chadian, Malian and Nigerien. Of the migrants identified, 35 per cent had been in the country for at least 12 months; 33 per cent had been present for between 6 months and a year, and the remaining 32 per cent had been in the country for less than six months. The Migrant Report also summarizes findings from 686 interviews that IOM staff conducted directly with migrants across nine different regions in the country. Seventy-one per cent of the 686 migrants surveyed began their migratory journey from one of the countries bordering Libya (Egypt, Sudan, Niger, Algeria and Tunisia) and the remaining 29 per cent departed from other countries in Africa, mainly from Nigeria, Mali, Burkina-Faso, Senegal and Ghana. Nearly 70 per cent of respondents paid less than USD 1,000 for their journey. On average, the migrants interviewed were 29 years old and 70 per cent had been unemployed in their countries prior to departing. The main sectors of work for those employed before they left were agriculture, raising livestock, the fishing and food industry, followed by construction, water supply, electricity and gas sectors, and retail, sales and manufacturing trades. Libya’s Displacement Tracking Matrix collects data on mobile populations in Libya to facilitate evidence-based humanitarian and policy interventions. All reports, methodologies and datasets are available at: www.globaldtm.info/libya.